Senco N series staples, 16 GA, 7/16 " Crown. Spotnails brand and Fasco brand. 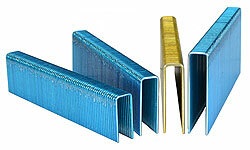 Galvanized and stainless steel staples available. F45C G-55, F44C G-50TL, Senco SKS-N, SNS41, SNS44XP, SNS45XP, SNS50 etc. Senco N, Bostitch 16S5 type staples. 1-1/2” leg. Galv. 10,000/box. Senco N, Bostitch 16S5 type staples. 2” leg. Galv. 10,000/box. Senco N, Bostitch 16S5 type staples. 1" leg. Galv. 10,000/box. Senco N, Bostitch 16S5 type staples. 1-1/4” leg. Galv. 10,000/box. Senco N, Bostitch 16S5 type staples. 1" leg. SS. 10,000/box. Senco N, Bostitch 16S5 type staples. 1-1/2” leg. SS. 10,000/box. Senco N, Bostitch 16S5 type staples. 1" leg. Galv. 10,000/box. Fasco brand. Senco N, Bostitch 16S5 type staples. 1-1/4” leg. Galv. 10,000/box. Fasco brand. Senco N, Bostitch 16S5 type staples. 1-1/2” leg. Galv. 10,000/box. Fasco brand. Senco N, Bostitch 16S5 type staples. 1-3/4” leg. Galv. 10,000/box. Fasco brand. Senco N, Bostitch 16S5 type staples. 2” leg. Galv. 10,000/box. Fasco brand. Senco N, Bostitch 16S5 type staples. 2” leg. SS. 10,000/box. Fasco brand. Senco N, Bostitch 16S5 type staples. 2-3/16” leg. Galv. 10,000/box. Fasco brand.